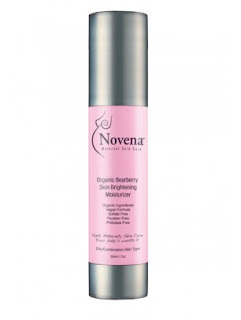 InTruBeauty: Novena Skincare Review and Giveaway! Today we bring to you a review and a giveaway on some products by Novena Maternity. Now, before you click away from this page and think "pssh! I'm not pregnant, this is not for me," just wait a sec. This company was founded by a licensed medical esthetician solely to provide a line of products that was safe, effective, and addressed skin problems associated with pregnancy such as unbalanced/dehydrated skin, breakouts, brown spots, and stretch marks. Do you like what you're hearing? Keep reading! It seems when a woman gets pregnant, she suddenly becomes very aware of what's on her skin, and what she puts in her body. Everything we consume and apply to our skin ultimately ends up in our bloodstream, and gets passed onto our developing baby, or if you're not pregnant, it still soaks up in to our body. If you're applying nasty chemicals to your skin, don't be fooled that they won't be wreaking havoc on your insides, even if they do seem to do nice things for your skin. 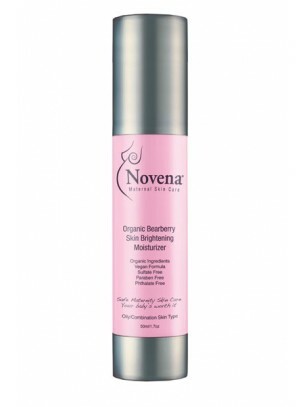 Novena Maternity is a complete skincare line that is free of parabens (a preservative), sulfates (a foaming agent), and phthlates ( a bonding agent), which are chemicals found in 90% of all personal care products. The ingredients are organic, vegan, natural, environmentally safe, and animal friendly. We can't wait to tell you about some of the great products we tried out, and let you know how you can win some for yourself! 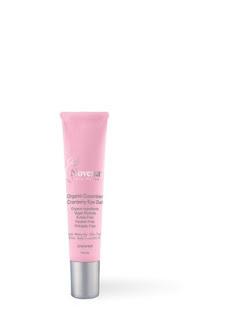 This was voted best organic eye gel by Fit Pregnancy Magazine! Cucumbers are supposed to cool and soothe, while cranberries diminish fine lines and dark circles. The company says if you apply too much you will feel the chill! Justina's Reveiw: I prefer an eye gel over a cream any day, as creams tend to sit on the eye area- especially if they're thicker. Gels sink in and get right to work and this gel was no exception! I didn't see a noticeable difference in my eye area after applying this, other than the skin around my eye area feeling softer. One unique thing I noticed was that rather than feeling the "chill" I tended to feel like the gel heated up a little bit after I tapped it on. I've never had that in any eye product- it was kind of neat! I can't comment on the packaging because I had a sample, but the website shows a squeezy tube rather than a pot. I love when products are packaged this way, so you don't have to continue to dip in. Another awesome thing- it's odorless, so your sensitive sniffer will have nothing to worry about. Jessica's Review: Unlike Justina I tend to prefer cream products since my skin is a little more on the dry side and I love the feeling and extra moisture that comes with cream products. I did like the cool soothing feeling this had, although I found if I put too much on or accidentally got too close to my eye are that it could sting. I do like that this product is organic and has good for you ingredients. This product was made for women who have existing stretch marks from pregnancy or growth spurts, and for women who want to help prevent stretch marks. It also heals and nourishes dry skin on the breast area. This is also odorless! Justina's Review: I like this product because it's safe for breastfeeding moms (it won't get yuck inside your child's mouth) but it's also great for women during that time of the month. As for the reducing stretch marks or preventing them- many companies claim that but there is currently no scientific proof that any product on the market effectively prevents or eliminates stretch marks- it's just one of those things for which there is no true cure. However, applying a lotion forces you to give yourself a bit of a massaging motion which feels nice on your achey body. Also, a little moisturization never hurt anybody! This was a nice odorless cream that felt good to apply and gave me the peace of mind I needed that I'm not hurting mine or baby's body. of Brown Spots Before and During Pregnancy. Or Erase the Spots Pregnancy Left behind. Jessica's Review: These products can be used even if you are not pregnant but just looking for some great organic products. I really enjoyed the smell of this product and the light weight feeling of this. I couldn't tell if this erased any spots as the sample I was provided was smaller and it usually takes awhile and at least a full bottle of a product to see noticeable results when talking about removing or reducing the appearance of spots. I found if I used too much or applied multiple layers that this could leave a sticky residue on my hands however.